Piety is something no self-respecting denizen of the enlightened twenty-first century wants to develop. And pietistic describes a self-absorbed and sentimental Christian, unable to face the deep demands of being a disciple of Jesus. This is a great shame. Piusand pietas describe qualities people truly desired in other times. As for pietism, the greatest exponent of it is perhaps one Johann Sebastian Bach, whose faith perdured despite the loss of eleven of his twenty children and blossomed into the single greatest corpus of music in human history. A pious person is simply someone who desires to be holy. Holiness these days is often translated as wholeness, or wellness, perhaps as a way of enticing those repelled by the word holiness or piety. While holiness is these things, it transcends them utterly. Holiness is nothing less than the quality of one who lives in the presence of God. It seems to this writer that being in Gods presence, drawn by a gracious invitation and discovering the inestimable love of the One inviting, is most desirable. Certainly more desirable than its opposite, which is damnation! Furthermore, being holy should be attractive, not repulsive. Someone who has tasted the love of God knowsmust knowsomething about how to love. Isnt that the quality of holiness itself, that one beloved by God responds by loving not only God but also those others whom God loves? Those objects of derision whom we call pious do not love. In their desire to be holy they exclude those whom they deem unholy, worldly, whose god, St Paul says, is the belly. It is precisely the priggishness that they display that makes them impious (another good word neglected). Piety, therefore, is the pursuit of an ever-greater sense of being in the presence of God. Daily prayer, reading the Offices, regular communion, spiritual direction, Bible study, lectio divina, reading the works and the lives of saints, these form a part of peoples piety. But also action that reaches out to the least of Jesus sisters and brothers is piety. And bringing others to meet Jesus is piety. In fact, piety describes the whole work of the Church together and of its individual members. The yearning that has re-surfaced and that we describe as spirituality is actually a longing for a means to become pious. In our seeking to avoid the priggish practice of church-ianity we have however walled off the tried-and-true methods developed over the centuries to develop our sense of Gods presence. Slowly, however, people are re-discovering the joy of daily reading of Morning and Evening Prayer, of the ancient art of spiritual direction, as well as some newer discoveries of the Pentecostal movement having to do with practicing the presence not only of God, of Jesus, but also of the Spirit. But there is a plenitude of resources yet to be re-discovered. One great new aid is a massive compilation of Anglican writings on the quest for holiness. 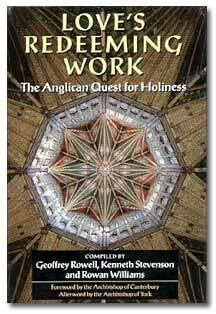 Entitled Loves Redeeming Work*, subtitled the Anglican quest for holiness, it is a great resource for all Christians, not just Anglicans, seeking to become pious. The three editors, Geoffrey Rowell, Kenneth Stevenson, and Rowan Williams, are all bishops. Their work is clear evidence that erudition has not yet disappeared from the British bishops bench. The accompanying articles are fine reading on their own. [Death]ll wear my face and yours. When we let go of the world, late ripe fruit falling. What these pious authors have in common is not some peculiar English character but rather a spirit that is recognizably Anglican: knowing themselves to be part of a Communion of holy people that reaches back before history. They each view the human condition, including their own, with a gimlet eye, always alert to self-deception and hidden pride. And they know that it is through the Church, that great collection of sinners, that God has revealed the means of grace and given us the hope of glory. Loves Redeeming Work is principally a most welcome aid to becoming a holy person. But it does so by helping us avail ourselves of the incredible wealth that Anglicans have to mine. It deserves a place in every library that claims to be a serious collection of essential Christian resources. Reading about piety is not enough, however. It is time to throw off the shackle of convention and make it our aim, each of us, to become pious people, as God gives the grace. When we are ushered into the inestimable joy and brightness of the unmediated presence of the Holy Trinity, we will then find that we were there all along.